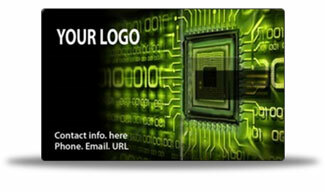 iBiz Cloud business card let your prospective or current customers get access to your data anytime, anywhere! Click HERE or the business card above to see a live view of cloud data. What's iBiz Cloud business card? True Cloud Business card - Are you a Business executive? Do you offer information to your clients in the form of brochures, documents or files? Would you like to give your clients a more efficient way of providing infomation? Would you like to grab an effective selling and marketing tool? iBiz Cloud business card is designed for accessing content from your computer. It works on the basic principle of USB flash drive and cloud technology. iBiz does not require physical USB storage, every time your audience inserts your cloud business card it automatically opens a cloud folder that displays your organization's profile, product information, or any data file you wish to share. iBiz Wireless card is designed to work for mobile phones. With built-in NFC wireless chip, access business card as simple as taping mobile phone on the iBiz card. Your prospects can call you, watch your marketing video, download product information, save your contact information, and more. For non-NFC enabled phones like iPhone, simply point the phone camera to the QR code and your business card will appear on the phone. Why do I need need iBiz Wireless business card? Just imagine having a simple system with which your clients can access your product’s information or data anywhere they want. Just imagine a tap on the iBiz wireless card, and they can access everything with only a Smartphone. Cool isn’t it? True plug-and-play - No cumbersome programming required, no autorun setting, no risk of virus, and no worry about user not knowing how to open data file. Cloud storage - Data are pre-loaded in the cloud. No need to worry about running out of USB storage and the fluctuation of USB memory prices. Most importantly, you can update your cloud data any time. Your customer will always have access to up-to-date information. Easy access - Access the data from PC or smartphone. Material - As thin as a credit card. iBiz business card is made with rigid PC plastic (polycarbonate). It is durable, and allows full-color imprint. iBiz business card is available in translucent or solid white material, which can be printed on both sides of the card. Cost effective - if you are budget conscious and need most cost effective USB flash drive - iBiz Cloud business card is your best option. Your own design or use stock design - It's about first impression. iBiz offers hundreds of stock design for you to choose from. Want to use your own design? No problem! Send us your artwork and we will send you a virtual proof. Cloud Reporting - Presenting before you the first of its kind - Cloud Report. Traditional USB flash drive is not capable of recording usage. Hoping or guessing is not a good strategy for your marketing campaign. iBiz Cloud report provides analytic reports to make sure your marketing dollar is in good use. Going with traditional USB card? 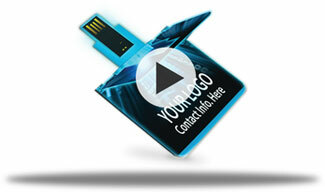 Ultra-thin USB card - Still like the idea of deliver content using USB card? No problem, we got you covered. Thin is in - The ultra-thin USB card is only 1 mm thin. Ultra-thin USB card fits nicely in the wallet. It is available in translucent or solid white.Available for full-color imprint on both sides to impress your customer. Size matters - Ultra-thin USB card is available from 1 GB up to 64 GB. Tell us your data size and we will upload content for you. Unique users count - User count report gives you a snap shot of the number of unique audience that uses your iBiz Cloud business card. Data view report - When user opens a document, view a picture, or watch a video, the access will be captured by the cloud report. Data view report can give you an idea the product of interest or the reasons your audiences need you. Demographics - Knowing where your audiences are some times is more important than knowing who they are. Demographic report gives you an idea of where your audience access business card.